One of the biggest issues facing Palau and the whole world is how to manage our coasts and estuaries. Almost half of the world’s population lives along the coast. The challenge facing us is how to maintain and protect these critical ecosystems and their functions while at the same time, continue to utilize them for the benefit of people that depend on them. 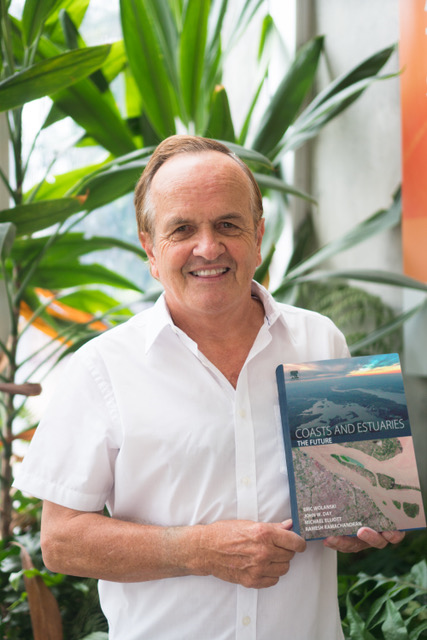 Professor Eric Wolanski, a long-term collaborator with the Palau International Coral Reef Center, is the lead editor of a major new book entitled “Coasts and estuaries, the future” – in which 154 world- renowned scientists from 27 countries describe threats to human societies from neglect of coastal and estuarine areas. This book describes how to protect coastal and estuarine areas as pressures from climate change and human encroachment increase. One of the 39 chapters in this 730 page volume is entitled “Successful Management of Coral Reef- Watershed Networks,” and was written by PICRC Board Member Dr. Bob Richmond, PICRC CEO Dr. Yimnang Golbuu, and their colleague from the University of Guam, Dr. Austin Shelton. In this chapter, the authors provide examples of how science has informed decision makers and community members in Palau, Guam, Pohnpei and Hawaii on improving management of land-use practices to protect coastal coral reefs and related fisheries. In other chapters, the book also compares the coral reef health in Micronesia with that in the Great Barrier Reef of Australia and in the Lakshadweep archipelago in India, and shows that Micronesia is the most hopeful for future generations as Micronesia pays more attention to sustainable land-use. “The book shows how we can both protect and maintain the natural system and also allow these coasts and estuaries to deliver services which produce societal goods and benefits”, said Dr. Wolanski. “It’s intended as a wake-up call to policy-makers and politicians who say they want a future which protects human safety, the economy and nature, while providing sustainable solutions.